Our monthly review of movie poster typography looks at the posters for Captain America: The Winter Soldier, Under The Skin, Hateship Loveship, The Quiet Ones, and others. With all the excitement surrounding yet another great TYPO Berlin conference, I almost forgot to post this month’s ScreenFonts. Kick back, relax, let’s watch some film (posters), quick! 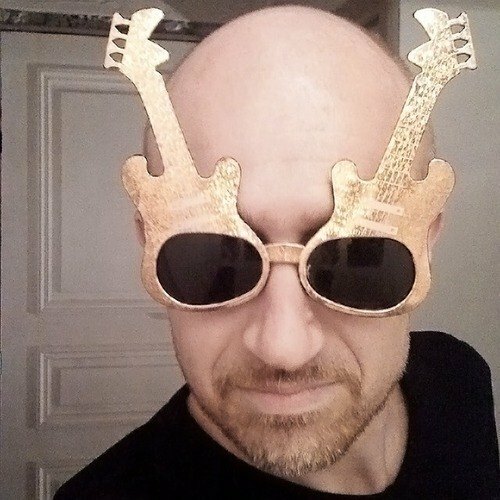 By the way, prepare yourself for a quadruple dose of ITC Avant Garde Gothic. We kick off this episode with a richly textured alternate design for The Unknown Known (don’t bother looking up the main theatrical poster). In this documentary former United States Secretary of Defense, Donald Rumsfeld, discusses his career in Washington D.C. from his days as a congressman in the early 1960s to planning the invasion of Iraq in 2003. 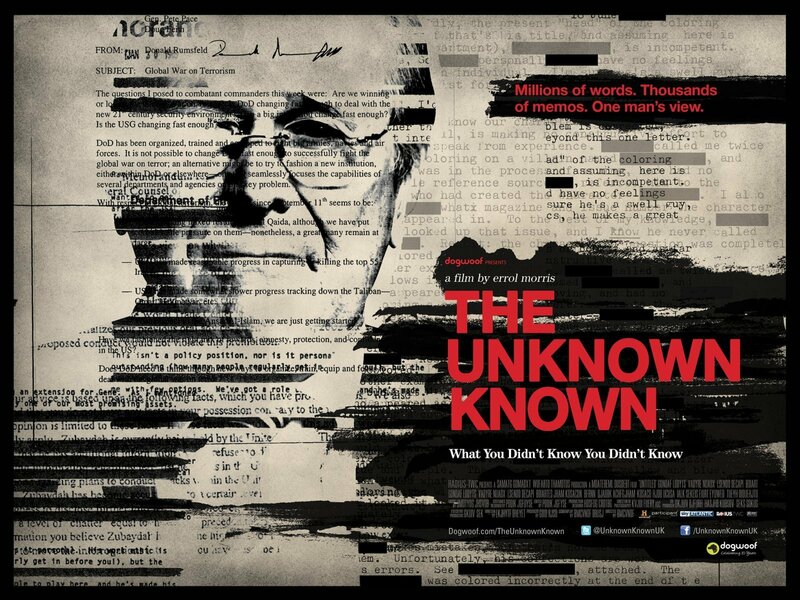 The interplay between the portrait of Rumsfeld and several (censored) texts overlaid on each other nicely visualises the film title. It suggests a life at the center of delicate government operations, where information is gathered, hidden, manipulated and steered. The combination of typewritten text, Times, Helvetica, black bars and the fragmented high-contrast portrait somewhat reminds me of Tomato’s astonishing artwork for Dubnobasswithmyheadman, Underworld’s debut album. Which turns twenty this year, imagine that! 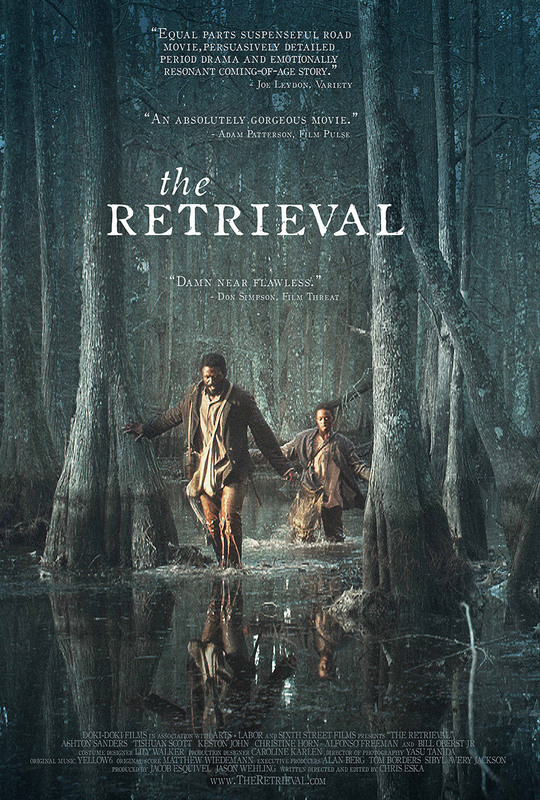 Kajsa Björs and Dylan Marchetti’s poster for The Retrieval is deceptively quiet, yet when you examine the scene the desperation and angst become almost palpable. By having the trees and water almost monochrome blueish grey and enhancing the golden brown tones, the two figures making their getaway pop out of the image. The distressed text serif face enhances the period feel, hinting at worn metal type. 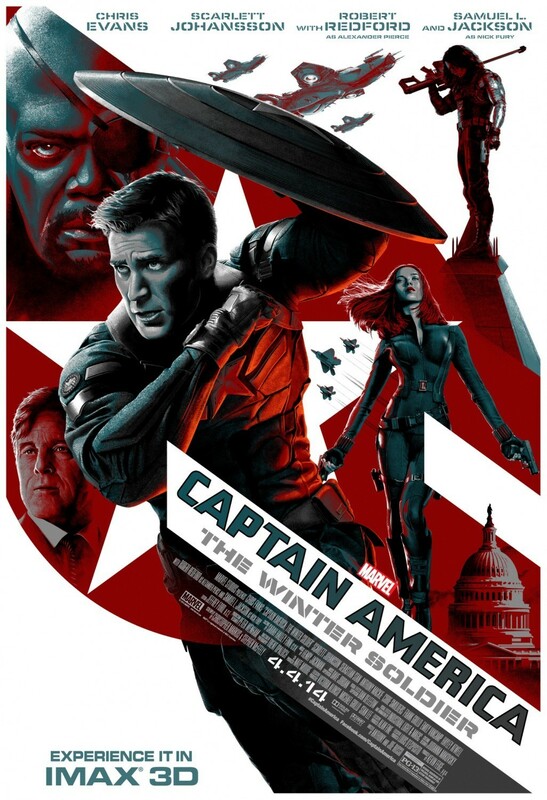 Whereas the “regular” posters for Captain America: The Winter Soldier are the usual action movie fare, this Imax poster yanks the design back into comic book territory. The stylised painted artwork looks like a classy cover for a trade paperback collection of Captain America comics. By toning down the reds and blues the mood (quite literally) gets darker, hinting at the ’70s espionage thriller atmosphere of the storyline. The typography interacts nicely with the iconic star-in-a-circle motif by way of white and red diagonal stripes, which also provide structure for the image elements. I did not recognise the square sans; the stencil typeface underneath the movie title is Eurostile. This great, dynamic design stands out against the rest of the film’s campaign. It’s always a joy to write an episode of ScreenFonts that includes work by Neil Kellerhouse. Neil not only is one of the most inventive and consistently brilliant film poster designers in the industry. He also manages to surprise me time and again because he does not really have a recognisable “signature style”. This means you never know what to expect (except that it almost invariably is an excellent design). Despite Neil Kellerhouse telling me he never once thought of the eighties when working on the moody artwork for Under the Skin, I originally interpreted it as a contemporary interpretation of classic eighties science fiction posters. 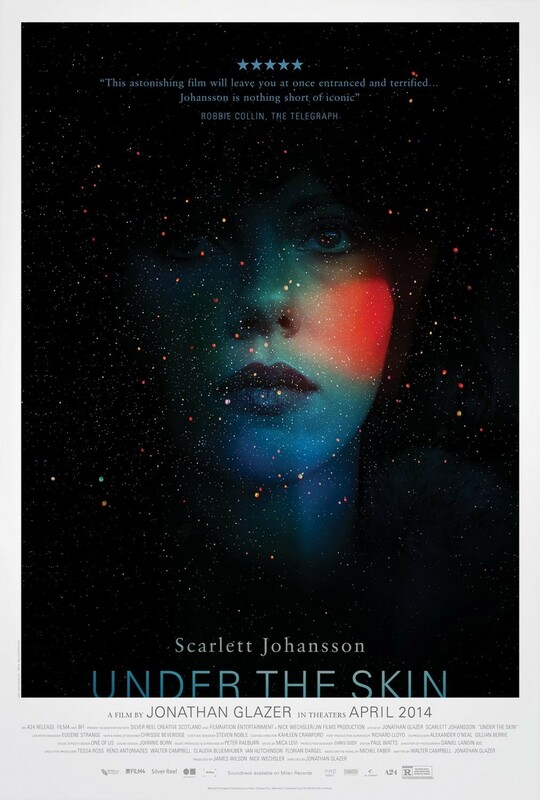 Neil makes only minimal use of Scarlett Johansson’s star power (pardon the pun) by making her face barely recognisable as it dissolves in the starry sky. According to Corey Holms all those stars were hand-painted; the fact that it was a rush job makes this design all the more impressive. Neil confirmed he ‘drew’ the planet/orb/stars and cleaned a lot of the smaller ones too, clarifying it was kind of a last minute surprise solution. The typography is almost bookish – Univers with generously spaced Sabon as a supporting typeface – which enhances the classic vibe of the superb poster. Having the movie title emerge from the bottom frame is an ever so subtle typographic play on the title. Neil Kellerhouse also sent me the nine pieces above which were used as Flysheets in the UK and for a digital campaign in the US. 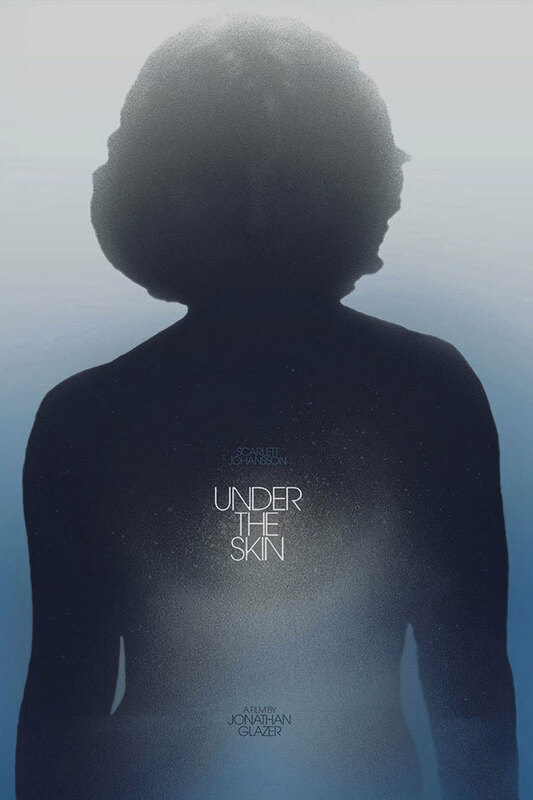 Searching for alternate posters for Under The Skin, I stumbled upon something interesting. 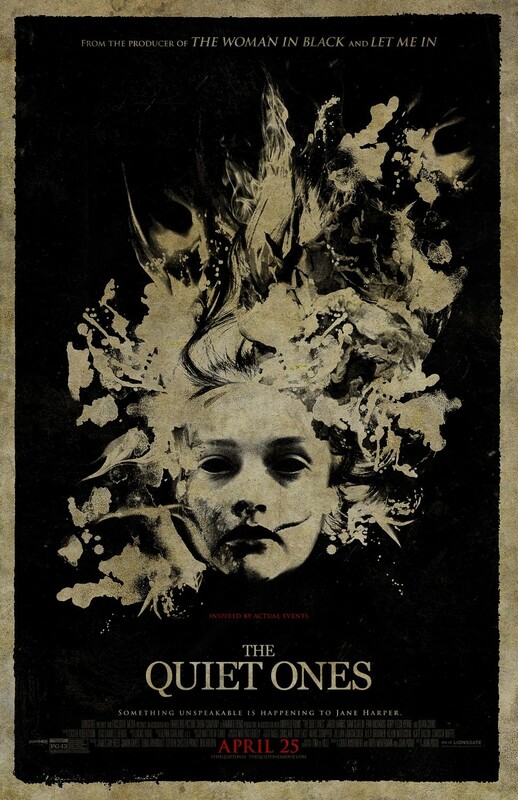 For the Frames series on The Dissolve, graphic designer Sam Smith created a custom poster and wrote about the film and his inspiration for the design. Even though both posters are entirely unrelated, I seem to also detect an eighties vibe that is typographically suggested by the true and tested ITC Avant Garde Gothic. Sam Smith sure seems to like the elementary shapes of ITC Avant Garde Gothic. 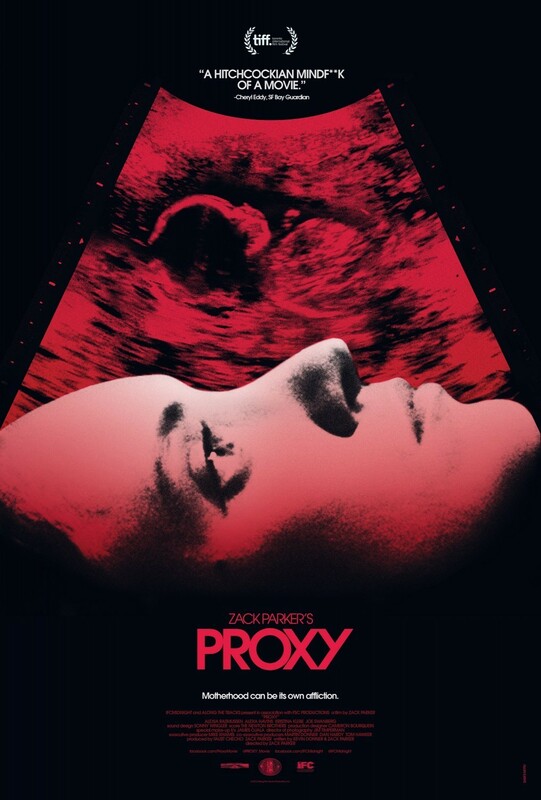 They also feature on his beautiful retro poster for Proxy. Part of the impact of these posters is the strong contrast and the monochrome palette (blue and red, respectively) which both simplifies and unifies the design. The poster visually translates this tense style by splitting up the dancer’s image into the three different “press runs” – cyan, magenta and yellow – as if his body fragmented, metaphysically ripped apart by separating the dance movement into its components. Instead of opting for an all-too-obvious distressed typeface, the designer created a great contrast between the grimy image and the sleek, seventies-style Grumpy Black 99. Finnish type designer Tomi Haaparanta loosely based the design of his fat face on the classic display type ITC Grouch. There’s another dance movie in this episode, yet this one takes itself slightly less seriously. I almost glossed over the main theatrical poster for Cuban Fury until I noticed the stiletto-ed foot kicking that Gotham ‘E’ out of its spot. Cute. 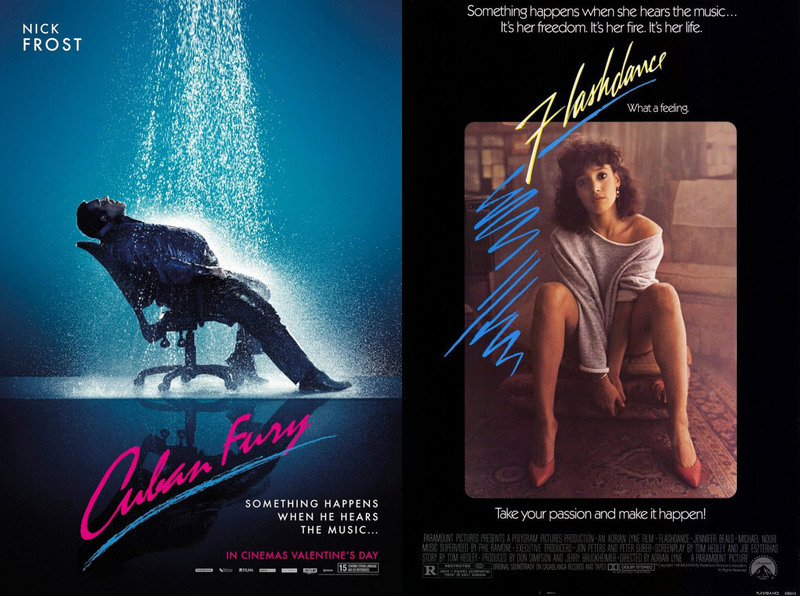 I don’t know how much sense this alternate poster makes to anyone under 40, still the nod to Flashdance is actually quite funny. To mimic the hand lettering on the eighties poster, the designer of the Cuban Fury artwork has Mistral follow the curve of the cyan brush stroke underneath. Because of its magenta colour the movie logo bears a surprising and frankly bizarre resemblance to the poster for Drive. Another, maybe not so subtle typographic pun can be found on the poster for The Final Member. The ‘l’ in the movie title is perfectly positioned – and printed solid in both inks – in this lovely two-colour design. 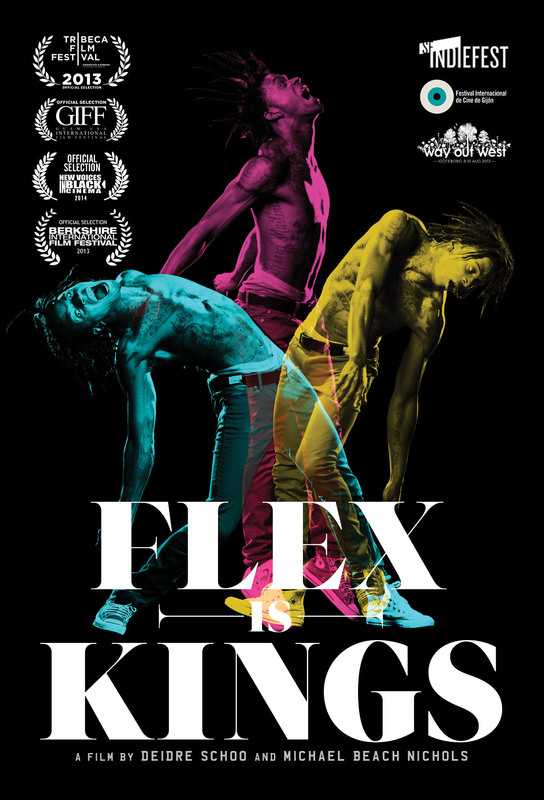 To come back to what I said about the typography in the Flex Is Kings poster, I wish the designer had used actual ITC Avant Garde Gothic instead of having a distressed version. The perfectly smooth, almost perfectly geometric letter forms would have contrasted beautifully with the vintage anatomical engraving. Because the engraving and the letters display a similar wobbliness the design lacks tension. 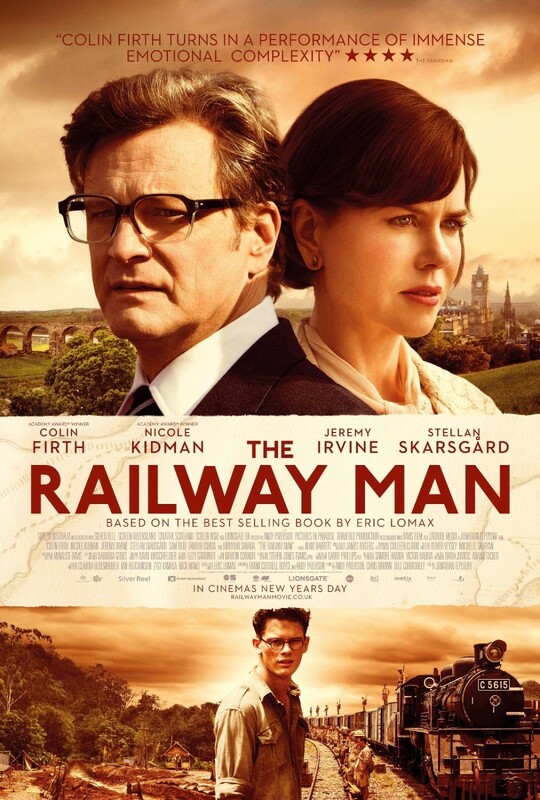 Agreed, it is not Trajan nor Gotham, but it’s just as obvious to use Edward Johnston’s P22 Underground on the movie poster for The Railway Man. The unsightly gap between the ‘R’ and the ‘A’ makes me wish the designer had paid a little more attention to the kerning. Those neighbouring letters are allowed to touch or even slightly overlap if the bowl of the ‘R’ is relatively small and its leg extends that far. 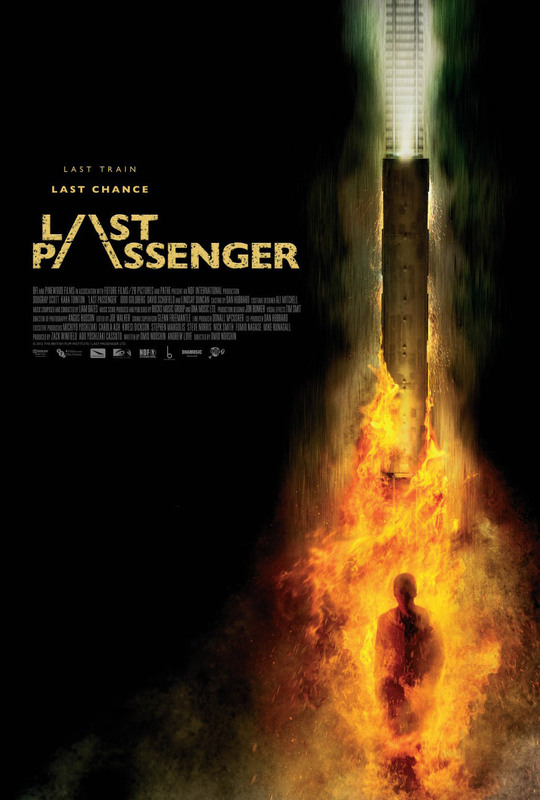 Continuing with the railroad theme, the movie poster for Last Passenger does something clever with Gill Sans Bold and one-point perspective. A stylised railtrack substitutes for the ‘A’ in both words of the film title. Simple and smart. Some people think I hate Helvetica. I don’t. I just think you better have a very good reason to use it. 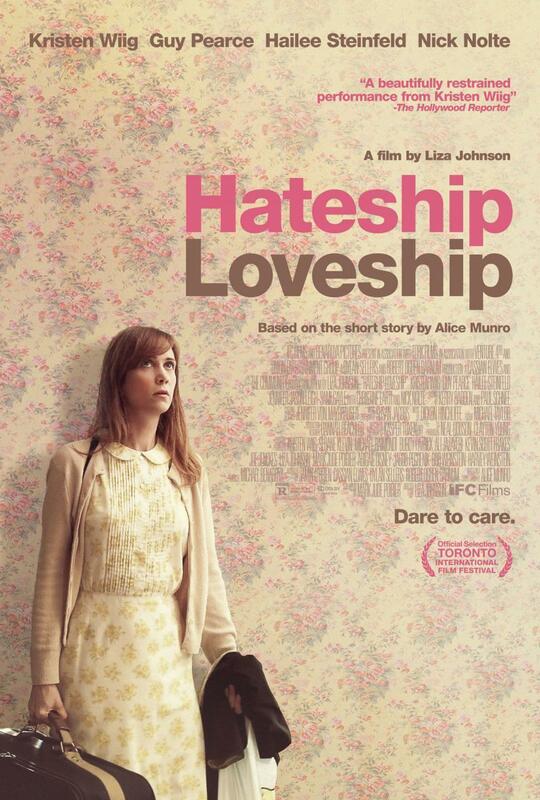 Hateship Loveship for example is a perfect case. Just like Kristen Wiig (according to The Hollywood Reporter) Helvetica turns in a “beautifully restrained performance” on its movie poster. The lock-up of the two words in the film title is so perfect it almost hurts. See how the capitals ‘H’ and ‘L’ and the extenders in the ‘hip’ at the end reach towards each other, almost touching. This solid composition is ideally suited for the weight of the letters and the figure-to-ground ratio of the compact character shapes. In true Modernist fashion all the type is set uncentred and in one single weight of Helvetica in different sizes, in just two colours sampled from the wallpaper background. Add to this the perfect placement of Kristen Wiig, looking at the film title, and the colour scheme that seems to extend into her dress, hair and skin tones, and you end up with a truly gorgeous poster. For all you Helvetica fetishists out there, currently the best digitisation bar none of Helvetica can be found under another name. [Neue Haas Grotesk[(http://next.fontshop.com/superfamilies/neue-haas-grotesk) restores the quintessential Swiss Modernist typeface (if you disregard Univers of course) to its original glory, and is available in Text and Display versions. Contrary to Helvetica, ITC Avant Garde Gothic, Trajan, Gotham et al FF Brokenscript is a typeface you don’t see on a film poster every day. 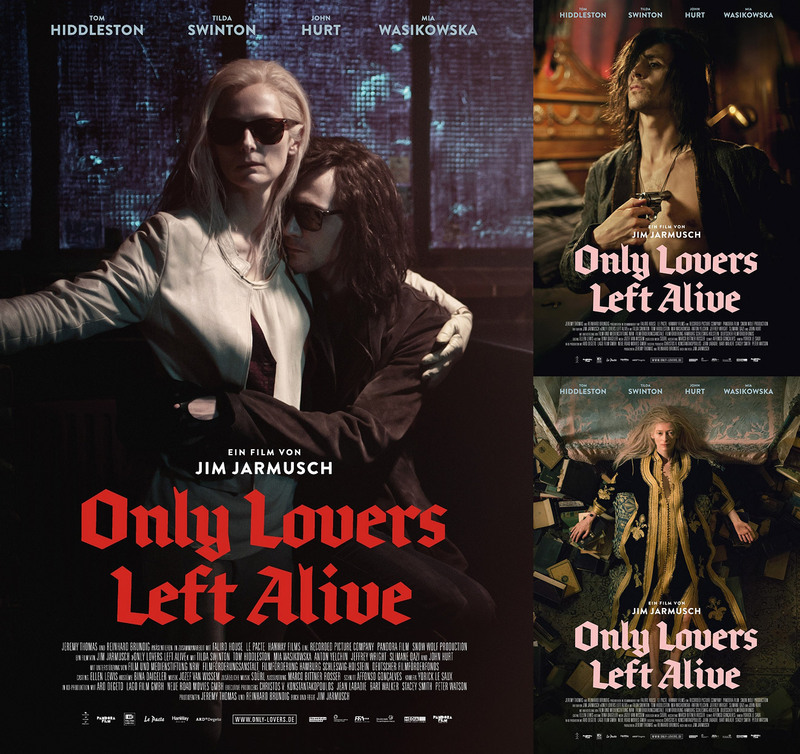 This modern interpretation of the blackletter injects just enough gothic atmosphere into the artwork for Jim Jarmusch’s vampire movie Only Lovers Left Alive while keeping the overall feel contemporary. Brandon Grotesque performs admirably as all caps supporting face. 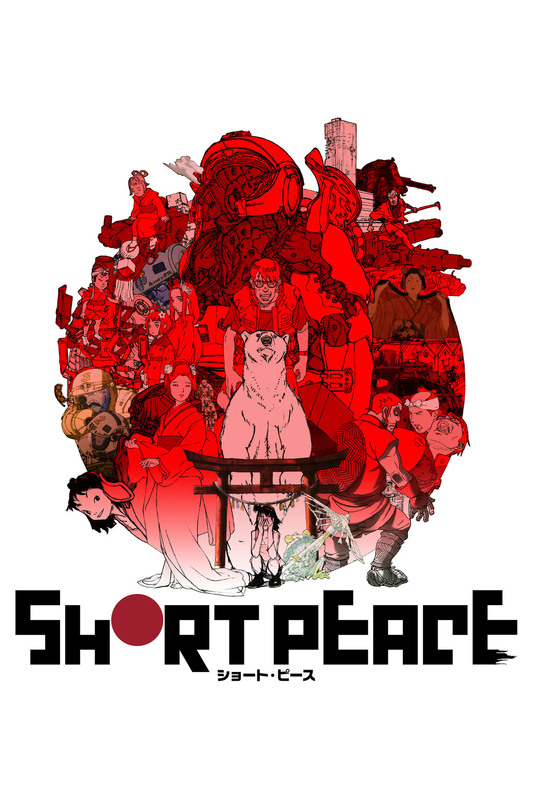 These strictly square, minimal letters on the other hand make the movie poster for Short Peace look decidedly futuristic. They remind me of Pierre di Sciullo’s FF Minimum. The restricted colour scheme and the minimalist geometric design (mirroring the Japanese flag) are quite unusual for an animated feature. An uncharacteristic and striking poster. 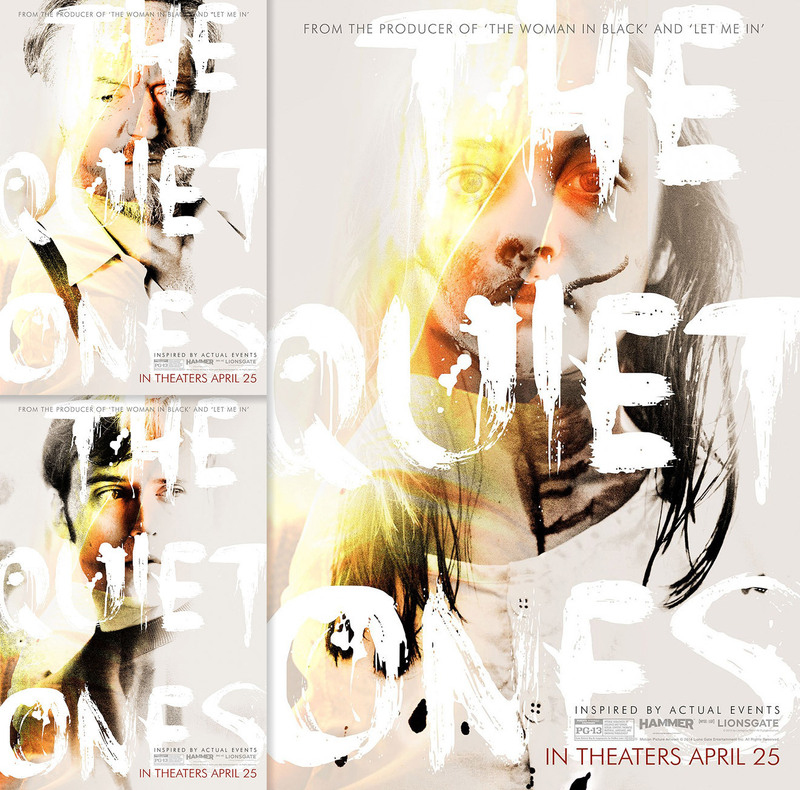 Another uncharacteristic and striking design is Ignition’s main theatrical poster for horror movie The Quiet Ones. Again the monochrome approach guarantees the artwork stands out against collaterals for other movies in the same genre. The very nice painterly elements around the girl’s face look like something between funeral flowers and petrified flames. I am not so sure about the use of Georgia because it looks a little butch. I think one of the more delicate styles of Miller – Miller Display or even Miller Banner – would have looked more in tune with this refined design. Ignition did a great job, but their artwork cannot compete with the astonishing alternate posters by Bond. Radically steering away from horror poster conventions, the actor’s portraits seem to be burning/melting, with the film title knocked out in bold, rough brush letters (the aptly named Face Your Fears). They are a breath of fresh air compared to all those same textured photos with distressed Trajan which are currently popular for horror movies. I talked to Peter Stark from Bond. 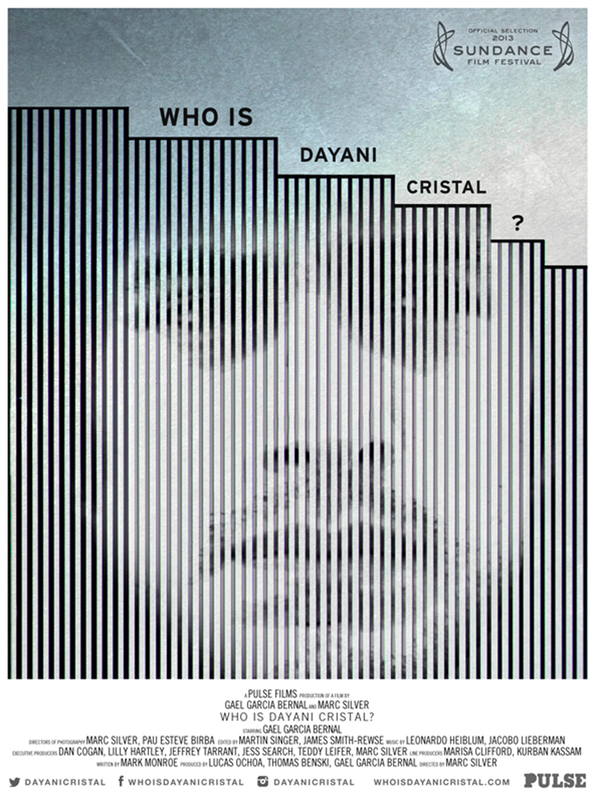 This intriguing poster for Who is Dayani Cristal? is the official artwork for the film’s word premiere at Sundance 2013. It was created by Daniel Grieshofer, head designer at Pulse Films. The film revolves around the discovery of the body of an unidentified immigrant in the Arizona Desert. In an attempt to retrace his path and discover his story, director Marc Silver and Gael Garcia Bernal embed themselves among migrant travelers on their own mission to cross the border, providing rare insight into the human stories which are so often ignored in the immigration debate. 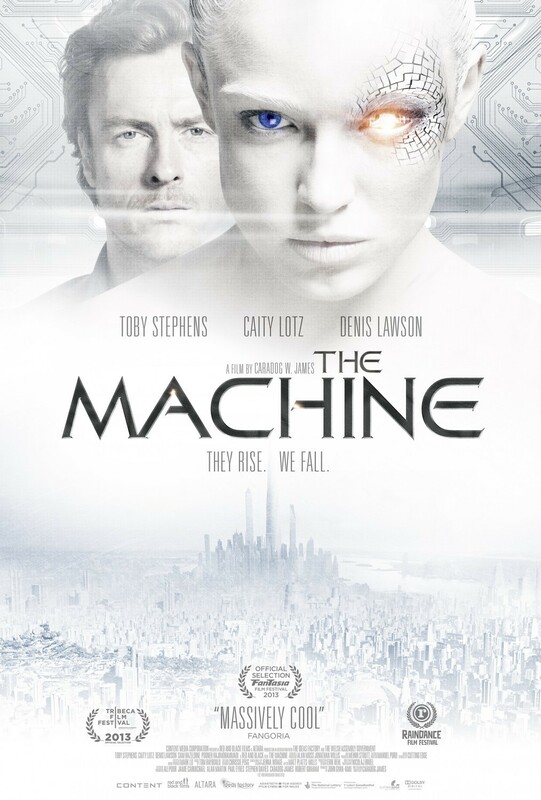 The poster for The Machine proves that branding with type is such a powerful means of expression that it can turn itself against the designer. Because it has been used on the posters for all six theatrical releases of the original Star Trek movies – from 1979’s original motion picture to 1991’s Star Trek VI: The Undiscovered Country – the typical lettering has become intimately associated with the cult science fiction franchise. Since it was eventually turned into the typeface Galaxy the signature typographic style can also be used for other projects, like this movie poster. Yet the close connection of the typography with Star Trek makes the design almost look like a knock-off, an unauthorised copy, and I have trouble believing it. 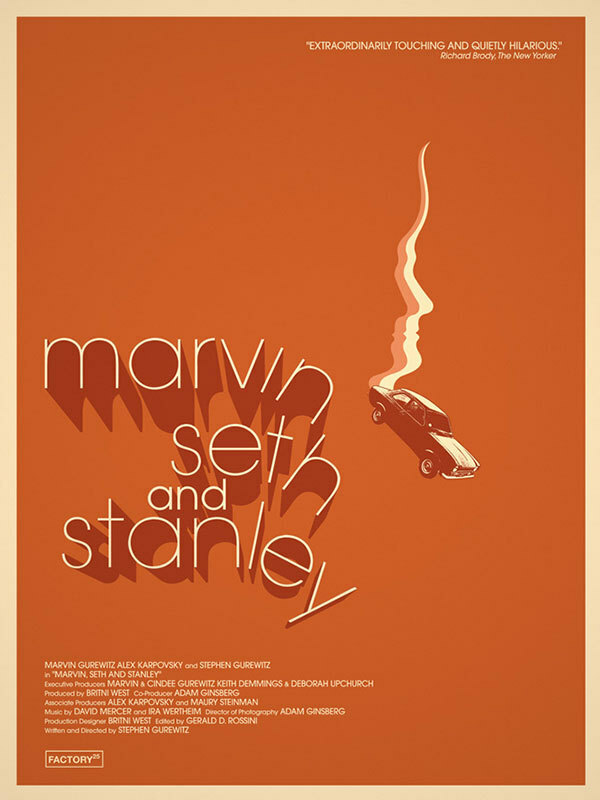 Although I am a fan of Jay Shaw’s work, I am a little dissatisfied with his very literal approach for the movie poster for Marvin Seth and Stanley. When we read the synopsis of the movie, suddenly every single element in the poster makes sense. Too much sense. The movie centers around two quarreling brothers and their father, hence the three profiles nested into one another to accentuate the family ties. The three estranged men join on a weekend trip in rural Minnesota, symbolised by the profiles forming some sort of trajectory with the car at the end. Finally the ITC Avant Garde Gothic letters tumbling down visualise the weekend “comically devolving into a series of daytime drinking episodes and botched outdoor pursuits.” This is all a bit too obvious for my taste. 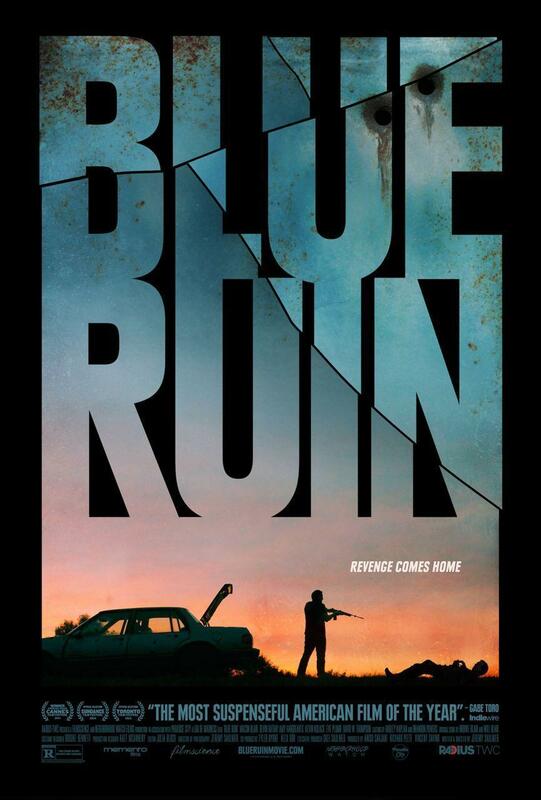 The movie poster for Blue Ruin by Palaceworks’ Erik Buckham does a great job by having the compact sans serif typography immense and serve as a framing device for the image in gorgeous sunset hues. The broken glass effect on the movie title echoes the gut-wrenching violence in the backlit scene at the bottom. 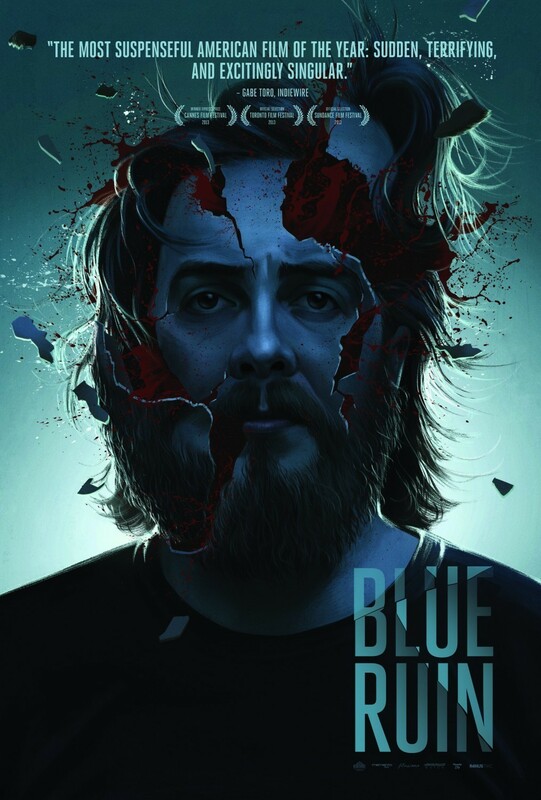 Funny story – studio mates Akiko Stehrenberger and Erik Buckham were both working on their own posters for Blue Ruin in their own offices and didn’t realise they were on the same job until everything was almost finished. The Weinstein Company even made Akiko use Erik’s logo on her poster without her knowing it was his design. Akiko’s original idea was to have the blood splattering from the exploding head blood be blue. She thought blue would be more metaphoric and artsy fartsy while red would never pass MPAA, yet unexpectedly the client encouraged the red. This makes the poster appropriately unsettling. The skyline sans is Heroic Condensed.